Slow Cooked Lamb Ragu. This Classic Italian slow-cooked meat sauce recipe has an incredible depth of flavor. The lamb shoulder is very moist, juicy and tender because it is cooked slowly in a crockpot on low heat for about 6 hours. I served this with homemade creamy polenta with mascarpone and parmesan cheese. 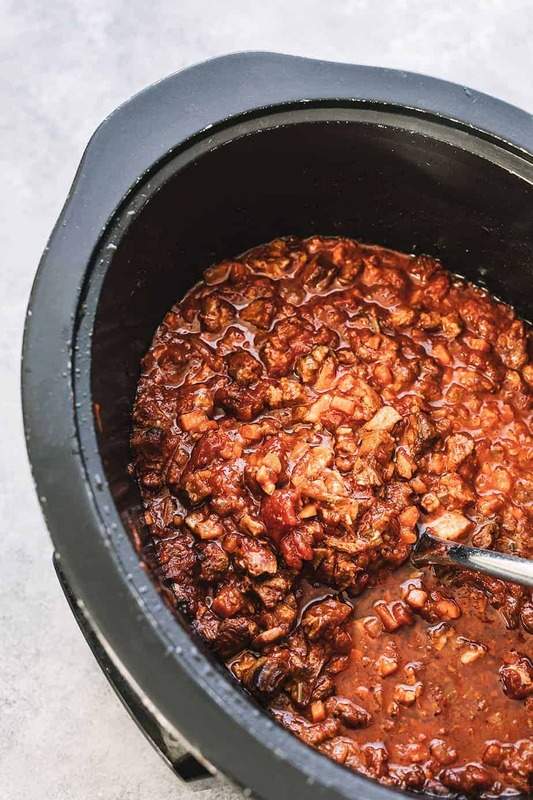 This Slow Cooked Lamb Ragu is made of simple ingredients: lamb shoulder, carrots, celery, yellow onion, garlic, anchovy fillets, marzano tomato, tomato paste, bacon ( or pancetta), bay leaf, chicken stock, dry red wine, and rosemary. To remove the bone from lamb shoulder, simply use your fingers to locate the bone, cut down vertically along the length of the leg to the bone, then begin to cut around the bone. For this slow cooked lamb ragu recipe, I used a lamb shoulder, but if you can’t find one feel free to use ground lamb or a lamb shank. I browned the meat before placing it in the slow cooker for about 3-4 minutes on each side, just until a crust forms on the surface. For the sauce, I sautéed bacon, anchovy fillets, yellow onions, carrots, celery, garlic on a skillet, just until they were browned and tender. I then transferred all of the ingredients, including Marzano tomatoes, tomato paste, chicken stock, bay leaf, thyme and rosemary into a slow cooker for 6-7 hours on low heat. I served the lamb ragu meat on creamy mascarpone polenta. 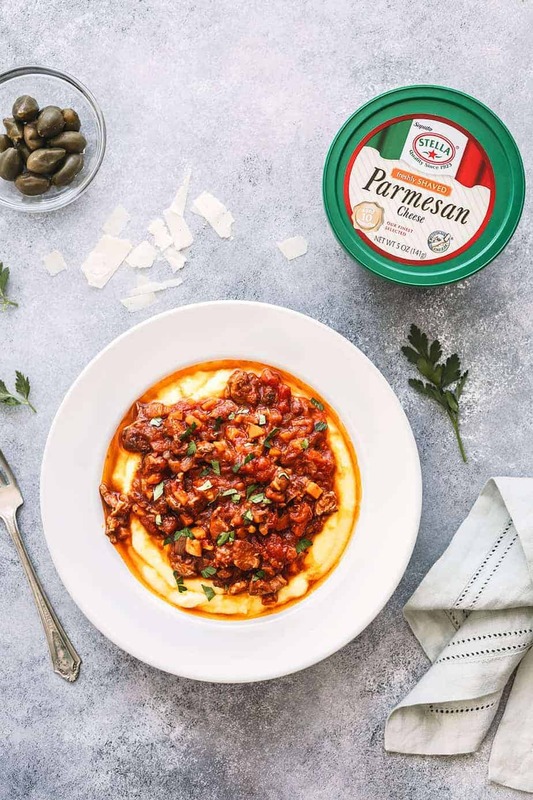 This creamy polenta recipe is so delicious, made of yellow corn grits, butter creamy mascarpone, and parmesan cheese from Stella® , and you may also serve this with Pappardelle. Hope you’ll enjoy this slow cooked lamb ragu recipe and don’t forget that Stella® is hosting the “Taste of Authenticity” Recipe Contest beginning November 1st through January 12th, 2018. Be sure to submit original recipes featuring Stella® cheeses for a chance to win up to $3,000. Three (3) prize winners (“Prize Winner”) will each receive a Visa® gift card (the “Prize”). 1st place will receive a $3,000 Visa® gift card, 2nd place will receive a $1,500 Visa® gift card and 3rd place will receive a $500 Visa® gift card! From the rich, traditional Parmesan to our trademark Fontinella® cheese, Stella® Cheeses grace today’s tables with a touch of historic charm, infusing meals with a hint of romantic flavor. In a large skillet add 2 tablespoons of olive oil, the lamb shoulder seasoned with salt and pepper, then cook until the meat is browned for about 3-4 minutes on each side. Cut into 1/2-inch dice and transfer into a slow cooker. In a medium skillet, add bacon (or pancetta) and anchovy fillets and cook until sizzling. Add carrots, onion, celery and cook over medium-low heat, stirring occasionally until softened for about 6-7 minutes. Add the red wine, bring to boil on high heat, keep stirring until the wine is reduced by half. Transfer into a slow cooker. Pour in Marzano tomato, tomato paste, chicken stock, bay leaf, thyme and rosemary into the slow cooker. Cover the slow cooker with the lid and cook for about 6-7 hours on low heat. Season with salt and pepper to taste. Served with pappardelle or creamy polenta, fresh chopped parsley and Stella Parmesan Cheese. In a large heavy sauce pan, bring water to a simmer. Add corn grits, stirring occasionally over low heat until liquid is absorbed and the polenta is softened (for about 35 minutes). Remove from the heat and whisk in butter, mascarpone and parmesan cheese until well blended. Season with salt to taste. Serve immediately. I love the combination of lamb and polenta!! This looks so delish . Nothing more perfect than meat cooked long and slow in a slow cooker.. yum! 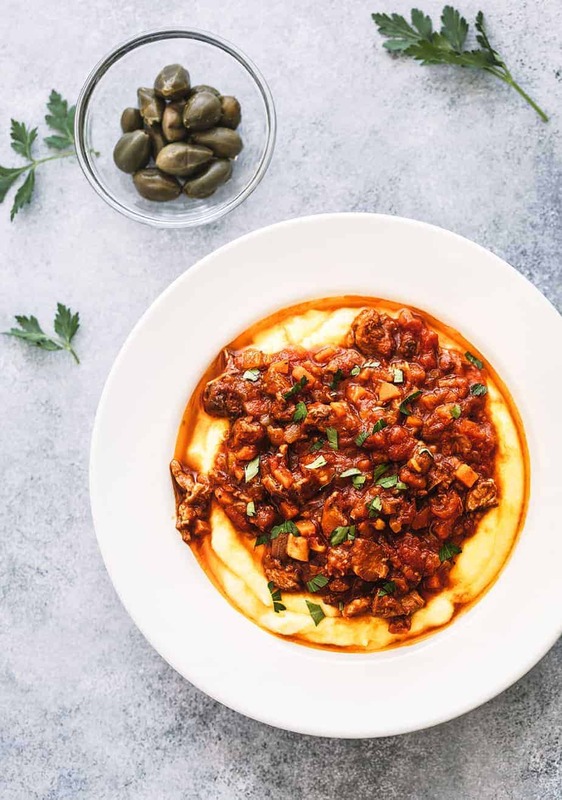 This looks like exactly my kind of recipe, I love anything with polenta! This looks absolutely delicious. I love that you served it over polenta! Oh, how wonderful it would be to come home after a long day with this waiting for me! I can almost smell the delicious aroma! This looks incredible. I need to make this recipe and cook lamb more often. Wow! That dish looking so yummy. Thanks for sharing. I don’t know much more about that dish but it seem’s very tasty that kind of dishes I always searching about..
It’s seems a new kind of recipe my family members will like it thanks for sharing unique and tasty recipe! omg! very delicious a new amazing recipe added to my list this is little bit different but I think it will be great in taste. Just collecting all the things to try at my home. thanks for the amazing recipe keep sharing with us!